We got blueberries in our csa box for a couple of weeks. This was delicious especially with the coconut streusel. Combine flour, baking powder, baking soda and salt in a bowl and stir with a whisk. Remove 2 tablespoons of flour and sprinkle over blueberries, tossing to coat. Combine bown sugar, oats, 1/2 cup of coconut, flour and cinnamon in a bowl. Drizzle metled butter over mixture and stir to combine. Place sugar, softened butter and oil in a bowl and beat until blended. Add egg and beat well. Add flour and buttermilk alternating between the two, beginning and ending with the flour. Mix well after each addition. Stir in zest and juice. Spoon half the batter in a 9 inch square baking pan that has been sprayed with non stick spray. Sprinkle evenly with blueberries and top with 1/2 cup toasted coconut. Spoon remaing batter over blueberries. Sprinkle with blueberry mixture. 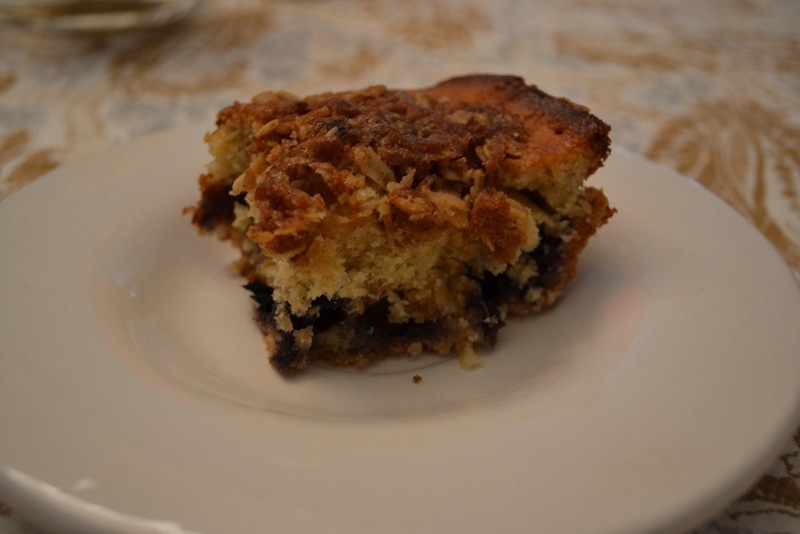 Top with streusel mixture. Bake for 45-50 minutes or until a wooden pick inserted in the center comes out clean. Let cake cool in pan for 10 minutes on a wire rack.